Piriápolis is a city and seaside town in the Department of Maldonado (Uruguay), located 97 kilometers east from the capital, Montevideo. It has a fixed population about 9000 inhabitants, although the floating population is much higher, especially between December and March. It was the first seaside town of Uruguay. Receives many Argentine visitors and a growing number of Europeans, although domestic tourism is very important. The city has its axis around the Rambla de los Argentinos, a coastal avenue that takes its name from the major customers of the founder of the city hotels: Francisco Piria. With an economy centered on tourism, the city has hotels and casinos, a very active nightlife in the summer months as well as public parks, religious centers, viewpoints, etc. The Chapel of San Antonio, at the top of the homonymous hill (one of many that surround the city on the Cerro del Toro), offers a panoramic view and can be reached by road or by air chair. For more intrepid travelers offers the possibility to climb the third highest peak in the Republic, the Pan de Azúcar, near the eponymous town, some 10 km outside the resort. Near Piriápolis are rock formations on the sea, called Punta Fría, Punta Colorada and Punta Negra, which are excellent for fishing all year. There are also white sand beaches such as San Francisco and Playa Hermosa, which are at a very short distance from Piriápolis. Piriápolis was founded by Francisco Piria (1847-1933). He was a great businessman, farmer (tobacco, olives and grapes, producing wine and cognacquina), mining (extraction of granite) real estate entrepreneur, philosopher, journalist, writer, and - they say - alchemist. In 1989 he acquired the land from the Cerro Pan de Azúcar to the sea, where it developed his agricultural establishment. A year later he founded Piriápolis: "The seaside city of the future". Piria pours his best efforts there. For its development project, it is an interesting case of territorial organization of Uruguay, and an inescapable landmark of its urban history. Very innovative at the time, was conceived as a comprehensive "European" seaside town project with a very elegant building industry and tourism infrastructure. In 1904 opened the Grand Hotel Piriápolis, where the first tourists stayed, was an icon of European splendor in Uruguay: furniture imported from Italy, dishes of Limoges, Murano glassware, carpets of Smyrna, Italian linen thread. The city land auction started in 1912 by the very Piria in Piriápolis and Bullrich in Buenos Aires. Never ceased to be erected irresistible attractions for new buyers and visitors: the Gran Hotel Piriápolis, Paseo de la Cascada, San Antonio shrine, the "Trilogy of the fountains": the fountain of the Cerro del Toro in Toro, the fountain of the Venus and the fountain of the Virgin (Stella Maris) and the promenade, which opened in 1916. Trees were planted, a school was opened, the International Youth Camp was established, and the construction of the church (which remained unfinished until the day of today) was started. Piriápolis was accessed by rail, bus and steam to and from Montevideo, and even a steamer from Buenos Aires. In 1930 is inaugurated Argentino Hotel Piriapolis main civic work until today, which was decorated with the most curious architectural and decorative resources whose origin is presumed linked to alchemy and Freemasonry. Also, its modern equipment, capacity and opulence was for decades an icon of the city. During that time the imposing splendor tourism development was fed by the spontaneous growth of the hotels and private residences of new residents. Piriápolis Grand Prix, a race of road racing which takes place in the resort of Piriapolis, Uruguay since 1994. The competition is played uninterruptedly, usually in October or November. Dates addition to hosting the "Campeonatos Nacionales de Pista de la Asociación Uruguaya de Volantes", this race was scoring date American Formula 3 from its inception until 2001, and then again in 2009 and 2010. 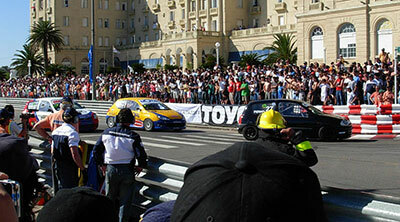 Street racing circuit used for the race is located on the boardwalk and has 2,500 meters long; since 2011 it is officially called "Circuit Asdrubal Fontes Bayardo", after the local driver. Due to the absence of leaks in much of the route and its extremely tight turns, many of them separated by less than a block, it is extremely demanding of drivers and cars. For example, the fastest lap by the South American Formula 3 in 2009 was 1: 22,545 to an average of 109 km / h.2 By contrast, it won the Formula 3 Euroseries in 2005 averages higher than 135 km / h speed in the admittedly tortuous street of Monaco and Pau.